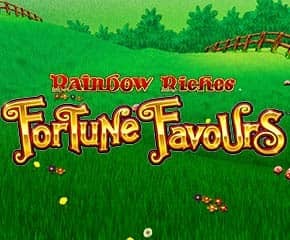 Rainbow Riches Fortune Favours is a slot game that is powered by NYX and Scientific games. The slot is based out on a leprechaun theme or Irish luck and has come up with everyone’s favourite leprechaun. This slots game is compatible to play on all devices including androids, tablets, PCs, desktops and laptops. The slot comes up with an RTP of 97.75% for its players. Play and Win in Rainbow Riches Fortune Favours! 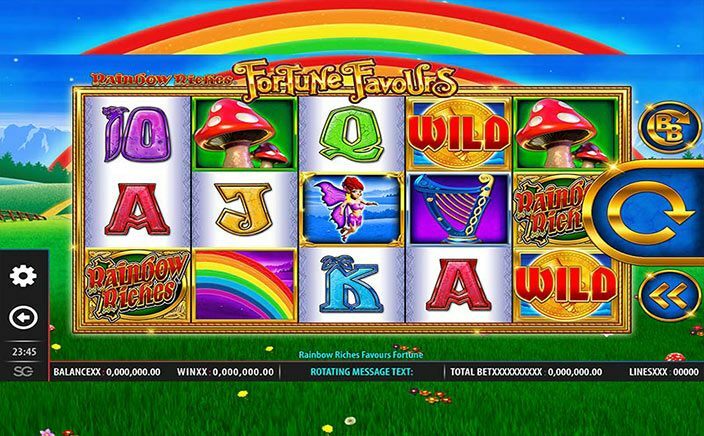 Rainbow Riches Fortune Favours slot is built with five reels and ten fixed paylines. The slot is set against Irish lush green fields and has rainbow and blue sky which makes backdrop beautiful. The players can have a min bet of 10p per spin to a max bet of £500 per spin. The standard symbols of the slot include harps, mushrooms and rainbows whereas lower value symbols are represented by Gaelic style 10, K, Q, J and A playing cards. The wild symbol of the slot is big on which a big red wild is engraved on it and it can substitute all symbols except for Magic Fairy bonus symbol. One has Magic Fairy symbol that is active at every stake one play at. The single Magic Fair symbol in sight at end of spin will change into the chosen symbol randomly and is known as Magic Fairy Bonus feature and if one gets few on reels, it will lead to many big wins. £10 Big Bet – Magic Fairy is active and gives the chance to change symbols. £20 Big Bet – Magic Fairy is active, and it also transfers to the subsequent reel set. £30 Big Bet – Magic Fairy wild and the Wild are active and Magic Fairy transfers to the other reel set. £40 Big Bet – Magic Fairy wild and the Wild are active and the Magic Fairy and Wild transfers to the other reel set. £50 Big Bet – It is same as £40 Big Bet but 10, J, Q symbols will be removed from reels for getting bigger wins. Rainbow Riches Fortune Favours is an entertaining slot and has attractive bonus features. The presence of vivid graphics, pacifying animations and melodious soundtracks have added more glory to this slot. You have an opportunity of earning a jackpot amount as big as 2500 times of your stake. In all, the slot is worth checking out.